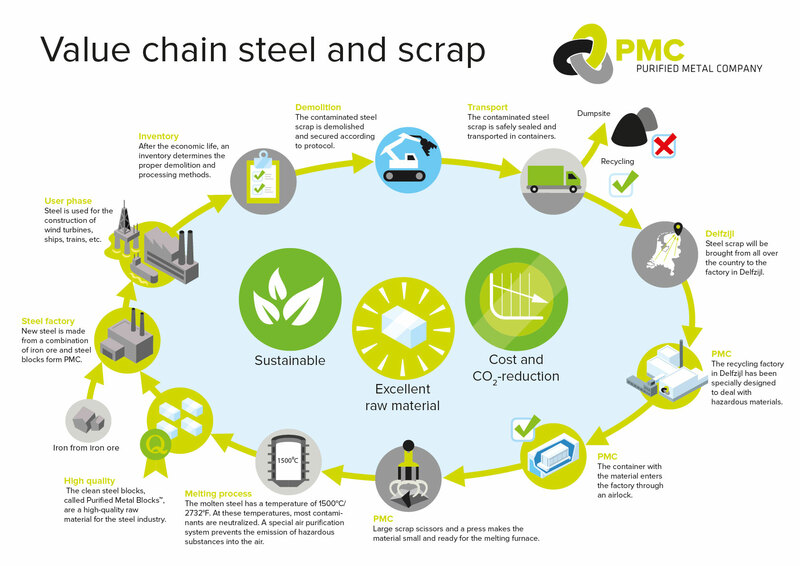 Purified Metal Company (PMC), a start-up supported by EIT RawMaterials, is the first company in the world to provide an environmentally-friendly and economically viable method to recycle contaminated steel scrap into a high-quality raw material for the steel industry: Purified Metal BlocksTM (PMBs). Via a patented process, fully based on proven and patented technology validated by the University of Aachen and further engineered by Küttner and Royal HaskoningDHV, PMC offers a unique solution for e.g. the dismantling, building and oil and gas industry to dispose their contaminated steel scrap in a cost-effective and sustainable manner instead of dumping it in landfills or cleaning it at high cost. PMC wants to build a state-of-the-art facility in Delfzijl, the Netherlands. This novel recycling facility will neutralise most pollution present and brings down CO2 emissions when compared to steel from iron ore. The company expects that the factory will be operational by July 2020 at the latest. After realizing the first factory in the Netherlands, Purified Metal Company aims to roll out the innovative and patented process for the recycling of contaminated steel scrap in the rest of Europe and the world. EIT RawMaterials has introduced PMC, one of the winners of the EIT RawMaterials Booster Call, to potential partners for realising the project and supported PMC financially to overcome critical stages in the development of the venture. In 2017, Purified Metal Company was nominated for the EIT Venture Award and was a Top 3 finalist at INNOVEIT, the EIT’s Innovation Forum.